Swords are cool. Fighting with swords is the most fun you can have with your clothes on, but it’s hard work and dangerous. 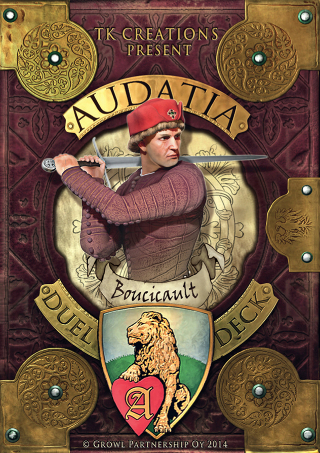 So we have distilled Guy Windsor’s decades of research and training into a duelling card game: AUDATIA. You will, as if by magic, learn the theory of Fiore’s art. If you decide to take up a sword and attend a beginner’s class, you will have a major advantage! Each Character represents a historical person: Marshal Boucicault, Galeazzo da Mantoa, or Lady Agnes Hotot. 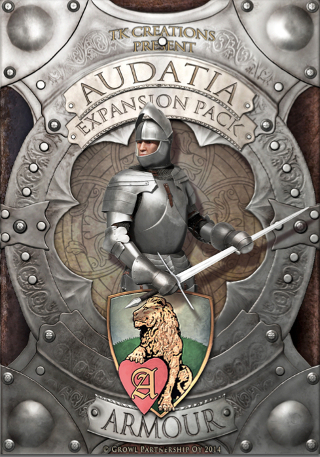 You can also simulate armoured combat with our Armour Expansion Pack! 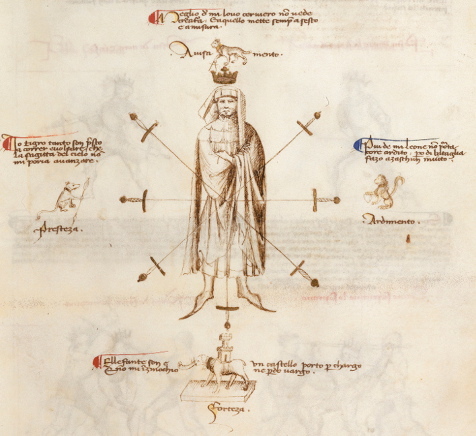 Galeazzo da Mantoa (ca 1370-1406) was an Italian condottiero (mercenary), who traveled the world having knightly adventures, one of which was fighting Jean le Maingre II, Boucicault, in a duel in Padua, in 1395. 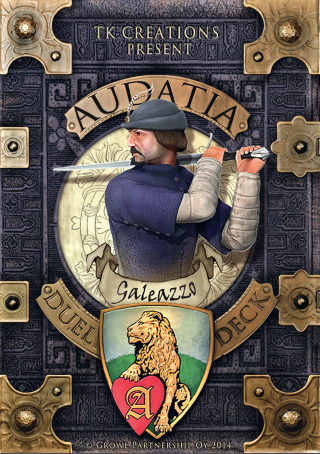 Galeazzo was a student of Fiore himself - and won the duel. They met again in Genoa in 1406, with the same result. Let’s see if you can maintain his winning streak! Jean Le Maingre II (1366-1421), known as Boucicaut, was a famous knight, a Marshal of France, and lead the vanguard of French knights at the battle of Agincourt in 1415, where he was captured. He fought two duels with Galeazzo da Mantoa, an Italian condottiero (mercenary): in Padua, in 1395, and in Genoa in 1406. 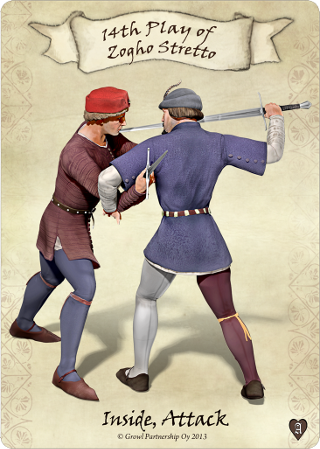 Unfortunately, Galeazzo was a student of Fiore himself--and won both duels. Let’s see if you can change history! Agnes Hotot (born ca. 1378) fought a duel while in her teens. Her father was in dispute with a neighbour over a piece of land, and they agreed to fight for it. On the day of the duel, her father had an attack of gout and could not fight, so she armoured up and rode to the appointed spot. They fought on horseback, and after a stubborn encounter she knocked her opponent, Mr Ringsdale, off his horse. He yielded, and she opened her helmet and let fall her hair, revealing that he had been bested by a woman. This Lady is used to defeating men; do Galeazzo, Boucicault or the Patron stand a chance against her? Let’s find out! In Armour with my Sword in hand, I am the Boldest in the Land, I can take ‘most any Blow, and put on a mighty Show! Cuisses, Greaves, Cuirass mine, Pauldrons, Cannons, Gauntlets shine, None can touch me, I’m a God, of War and you’re of mortal Sod! I catch his Sword between my hands, As Fiore’s Art demands, Stab him Grab him, Throw him down, Ope’ his helm and go to Town, I get behind him as I pass, and stab him where? In the Arse! With this Expansion Pack you can add armoured combat to your Duel Deck’s repertoire; make your Character less vulnerable to strikes, and give your Character the techniques to defeat an armoured opponent. You will also need two Duel Decks to play; and for a fair fight, your opponent needs an Armour Expansion Pack too! 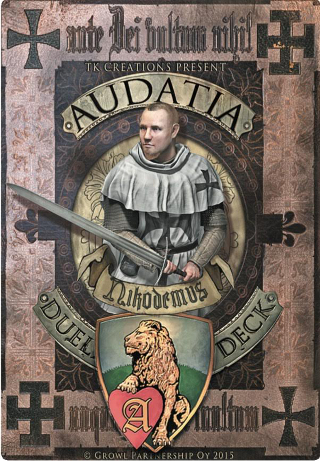 I am the renowned knight Nikodemus Kariensis, Master of the Liechtenauer style of longsword combat, and The Patron of Audatia. a Play me and you get to use my magnificent skills in the Liechtenauer style of swordsmanship, destroying our enemies with potent efficiency. Bring on your mandrittoes and your porta di ferros, I shall smite you all with my mighty Oberhau, my Hidden Strokes and my cunning Winden! To face you, if they dare, your opponent will need their own deck. Who Is This Fiore Chap, Then? 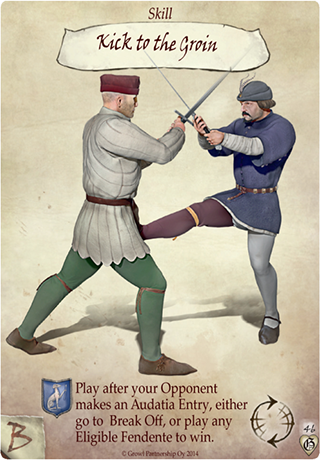 Fiore dei Liberi was a respected, widely known knight and martial scholar in 15th century Europe, a true martial champion in a period which did not lack martial champions. He is famous because of his astonishing manual of medieval combat, the Flower of Battle. It is the most extensive documentation of the martial arts of the time. We study and follow it rather seriously. 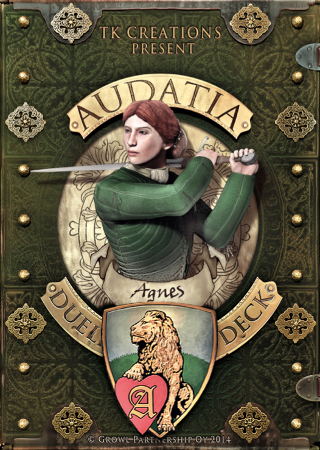 In AUDATIA we’re focusing on Fiore’s longsword technique. 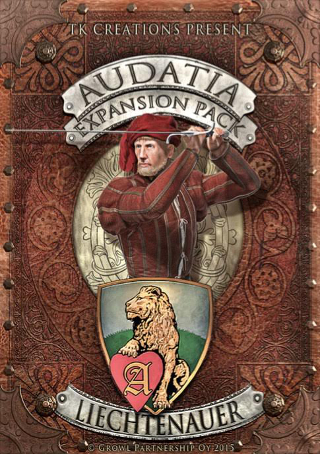 Expansions to AUDATIA include armour, and the contemporary German Liechtenauer school of swordsmanship. Guy Windsor has dedicated his life to studying the martial heritage of Europe, and teaching it to everyone willing to be part of its living legacy. He opened his school in 2001 and has been researching, training, writing, and teaching full-time ever since. He has published half a dozen books on the subject and is widely regarded as an authority on medieval and renaissance Italian swordsmanship. His school has branches and study groups on four continents. We think so too, and are thoroughly enjoying stabbing our friends and organizing tournaments to establish our mastery. 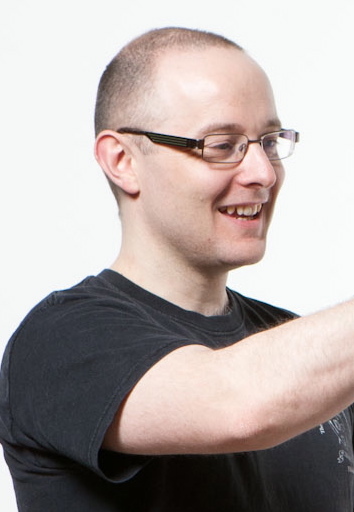 We have designed it and run hundreds of test games to make sure it plays very well (it does!) and true (every time gameplay doesn’t match swordfighting reality, we fix it, or let you know why we can’t). We have amazing art that shows you exactly how your attempts at slicing up your friends are playing out. 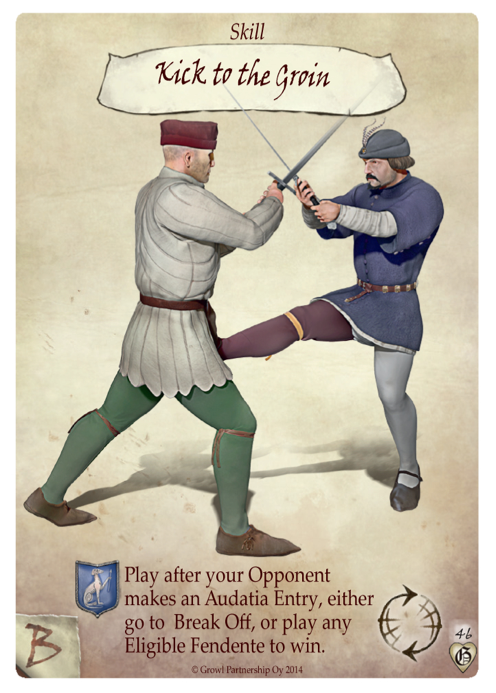 As a student of the longsword, you can use the card art to familiarize yourself with the positions - everything is accurate, from footwork and blade positioning to hairstyles and hats! The first two decks are now printed and available; we are working on two more decks (Lady Agnes Hotot, and the Patron Deck) and two expansion packs (Armour and Liechtenauer). We are looking for ways to bring the game to a game store near you, and you can buy it direct from us. Please get in touch with any questions you may have. We try to respond to all messages within three days. We promise to keep your details safe, and will not send you unnecessary messages. The game could not have been made without the creative team, our advisers, our playtesters and our supporters.